What was the situation of this corridor before? Is it a main corridor? I feel it is very smooth traffic now, very good and a very impressive scale. 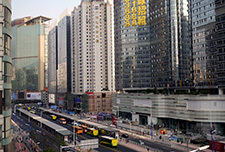 […] Lanzhou has the conditions for BRT. 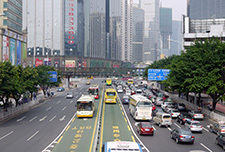 […] We should learn from the best practices from China and internationally to do a good BRT project in Lanzhou which really can solve the traffic congestion problems. This trip is worthwhile! I have totally changed my opinion about BRT. The experiences from Guangzhou are extremely useful as a reference for Yichang. I appreciate Guangzhou's praiseworthy BRT management concept, which along with the BRT operational system is comprehensive and advanced. 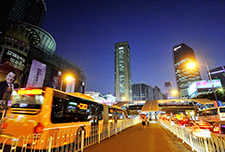 Wuhan will reference Guangzhou’s experience and accelerate Wuhan’s BRT construction. Thanks for the great site visit program! The party including myself learned quite a lot. The interest of Marikina city is in the bike ways and the transport system, and the site visit has really helped, not only Marikina city but the whole Metropolitan area to learn and understand. Like the Greenways program, this river [Donghaochong], I believe we can do this in the Philippines, especially in Marikina. This type of training can really have an influence not only on getting more cities to think about Bus Rapid Transit, but when they do, to implement Bus Rapid Transit to a much higher standard. 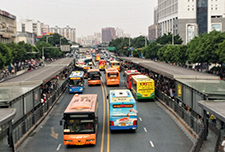 The opportunity to come to the place, either Lanzhou or Guangzhou, to touch and feel and experience Bus Rapid Transit really made all the difference. 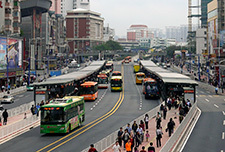 The Guangzhou BRT can be used as a very good example and best practice for the Lanzhou BRT implementation. 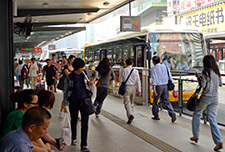 Promoting public transportation is one of the important methods of relieving the traffic congestion in city. The training is quite insightful. 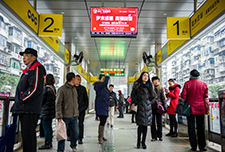 The Lanzhou and Guangzhou BRT systems are quite different; it has illustrated the flexibility to me of BRT systems and how they can be tailored to individual cities. I found it to be a really valuable experience. Thank you, it's great work that you are doing here. We had listened and heard about it a lot, but for these couple of days we have actually experienced it, and we are now really realizing that this is the important and urgent solution for us. […] We hear things a thousand times, but we need to see by our own eyes. It’s better than just listening. I hope there will be another BRT training in the future and we would like to send another team to join. 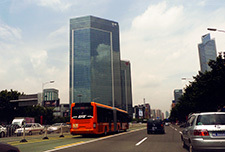 Guangzhou has a world-class Bus Rapid Transit system. It is well worth visiting and studying by other Chinese cities. We are now in the planning stage for BRT and most policy people do not know about BRT systems, so it is very difficult to implement. But the Guangzhou BRT field trip has helped us a lot. We really benefited from this visit. It is a great system. The BRT site visit was the best part of the whole trip. 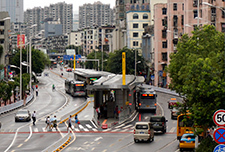 Guangzhou BRT is such an amazing project in terms of its scale and its infrastructure. 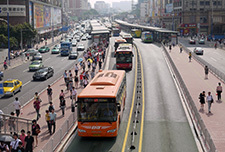 I was really amazed by the Bus Rapid Transit system in Guangzhou. I think we will have to do a good job in Manila and we will have the same system. I was very impressed. 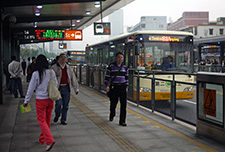 Guangzhou BRT is one of the best systems in the world. I like the design of overtaking lanes, and the design of multimodal integration with metro rail, bicycles, and pedestrians. It is fantastic. Thank you so much. The visit was so educational and I learned a lot. I think we will keep bothering you with the visits of our colleagues here more and more. I certainly want my colleagues to see things here, too. 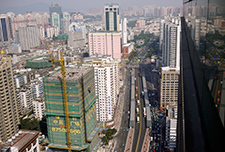 Guangzhou BRT’s construction is huge, which is different from other city’s BRT model. […] We think ITDP China has rich experience in BRT planning, which can help us on the facility study, planning and design in Kuala Lumpur. 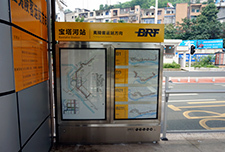 Guangzhou BRT is becoming one of the references now in the world. In Jakarta, we started the system before Guangzhou, but can see the system here is more integrated. 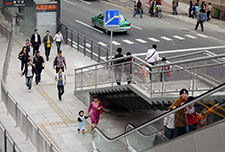 How you design BRT is not only about BRT itself, but also the supporting facilities such as pedestrian facilities, bike sharing and station access from the surrounding properties. Changes of the Donghaochong greenway have impressively improved the surrounding area. It's an inspiration for Californian cities. We should implement similar greenways around our waterways to provide public space and spark urban regeneration. 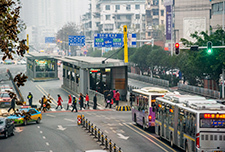 The BRT system in Guangzhou is a good example of sustainable transport and it was really important for our experts and decision makers to have an inner look at the system and its management for the future implementation of our own project in Almaty. 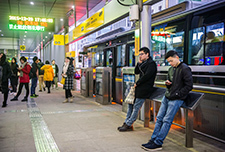 With the support of ITDP and ADB, Yichang is aiming to learn from Guangzhou's lessons in construction and operation and build a better BRT that serves as a demonstration BRT system to Chinese and international cities. 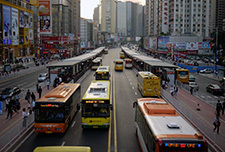 I have heard about the Guangzhou BRT many times before, and searched for information from the internet. But: seeing is believing. Through this visit, we understand the corridor for BRT must choose a high passenger demand location which will be worthwhile to implement. And learned that the size of BRT stations will be determined by the passenger demand, and the reason for not setting the BRT station near intersection. And the importance of changing the traffic signals and doing intersection improvements. In this trip, we have asked specific questions regarded the Nanning BRT planning, and the engineer of ITDP provided professional and useful answers. The information learned from this trip will be well applied to Nanning BRT’s planning and implementation. 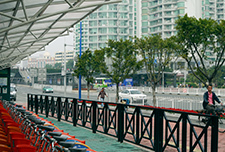 We hope the Nanning BRT can be as successful as Guangzhou and a best practice model for other cities. 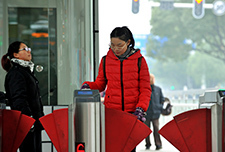 There are certainly plenty of practical things to learn from the Guangzhou BRT, bike sharing, greenways and urban redevelopment projects and I am hopeful that we can initiate at least two of these types of projects in the near future. My first interest is developing a BRT project within the confines of a redevelopment area. BRT is great, it is the best solution to improve the transport system in Dushanbe and to improve the situation of traffic jam and good for pedestrian, and to decrease that any bad situation of the further transportation. So I think, BRT is the best transportation system. It is an amazing project where we learnt a lot. We thank ITDP, who gave us thorough briefings not only BRT but also related things, which was very informative. We may fully use the experiences from Guangzhou BRT and its philosophy and apply them to other parts of the country and the region where it is feasible. I was very very impressed with how they integrated the BRT system and are able to carry so many people; 850,000 passengers per day. […] And it delivers more people per hour and per day than many of the metro rail system anywhere around the world, so I am very impressed. I have really enjoyed the tour today, I think it is probably one of the only ones like it, based on all the information and statistics that we have seen. I am familiar with several BRT systems in United States but nothing to this scale. There are great opportunities to apply this concept and this idea not only here but in other places around the world. This Greenway (Donghaochong Canal) tour is fantastic it’s a huge conversion from it was before to what it is now! 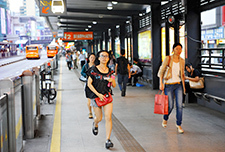 I am impressed by BRT services around Guangzhou and I appreciated how BRT and greenways benefit the community. And this kind of greenway is better to put in the community places as it is here, rather than in some remote location. And I think this kind of project should also be carried out in our country. 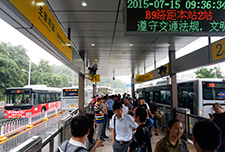 Guangzhou’s new Bus Rapid Transit system is barely a month old, yet its high-speed service, with pre-paid boarding and exclusive lanes, is already attracting 800,000 passengers a day — half as many people as ride New York City transit buses. It is the most interesting site visit tour I’ve ever been on. We don't just sit and listen to presentations showing how great the project is, but actually see it in real life! It is a very good demonstration. 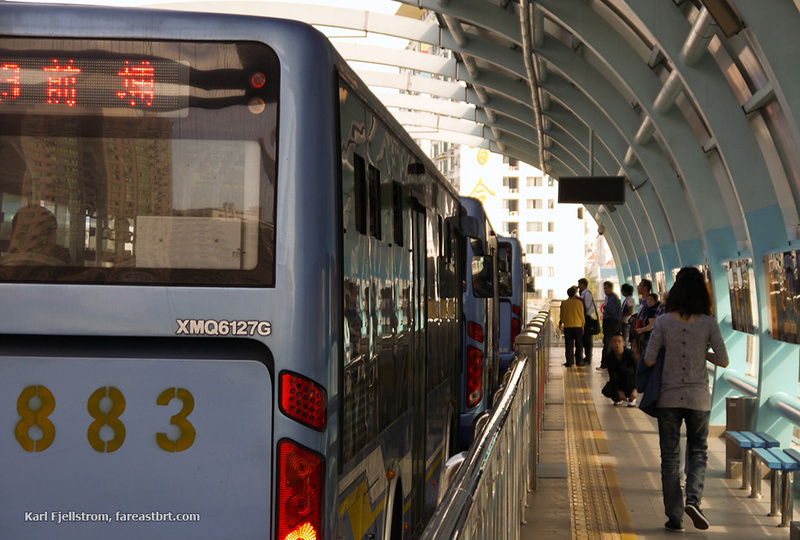 The most impressive thing I saw during my visit to Guangzhou was the new BRT system. 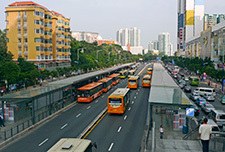 The Guangzhou BRT system just opened in February 2010, and ridership is already more than 800,000 boardings per day. The city leaders and transportation professionals we met with all seemed smart, innovative and prepared to take on the tough challenge of managing congestion. We were taken to the narrow section at the BRT corridor (in Yichang) which very much fits our situation in Almaty. It was very useful for us to understand how you find the design solution for this narrow section. It is very important for us to start building it because the Mayor of our city has given us an assignment to commission the BRT before the end of 2015. So we have to really hurry up in making our own design. As an architect and a planner it was really mind boggling to know that the BRT is so successful. I just hope that it can be implemented all over China. 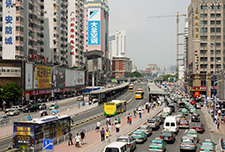 BRT as a solution of traffic congestion has achieved a successful result in Guangzhou. That’s a huge encouragement gained for BRT, I hope BRT can continuously bring positive social and environment impacts to Guangzhou. We very much liked to see the whole BRT concept starting from the design then the implementation to actual operation. We received a lot of information relevant to Almaty's situation. We clarified many issues which were theoretically kind of known to us, however here we saw how they are practically implemented. It all makes more sense now. We appreciate the effort from ITDP to bring our group to see the BRT and give us the technical presentations to the reporters. After this trip we will definitely bring more groups in for seeing the BRT the near future, and ITDP will be our choice to conduct this program. 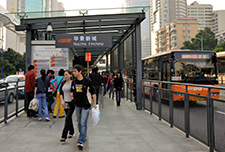 Guangzhou BRT is a very sophisticated system with dedicated lanes, off board fare collection and high quality buses. The priority to public transport by providing passing lanes at the stations show good results with very high frequency of buses on the corridors. 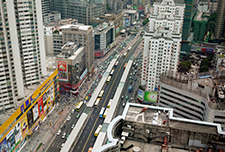 It's a huge BRT system and one of the best examples of BRT to study. It is good to see the Guangzhou BRT in person. 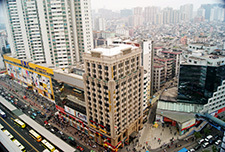 Guangzhou is very successful, and I hope Indonesia can learn the experience from Guangzhou. 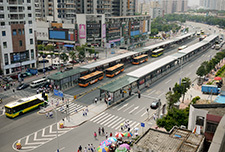 Congratulations to Guangzhou on the BRT’s success. 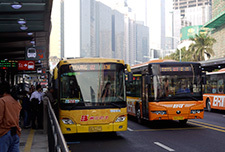 Its capacity is huge, which changes Guangzhou’s whole public transport system. Moreover, I am glad to see that along the BRT corridor there is a bike sharing system. 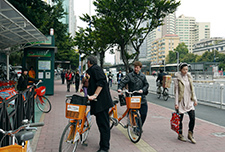 I am also promoting the biking sharing system in Kaohsiung, and I hope that the Guangzhou bike sharing system can also achieve the level of success of the BRT. We now understand the planning, design and implementation of BRT. It was a great learning experience for our experts in urban planning. We come to see what the China is doing along the lines of mass transit. So far I’ve been pretty impressed. 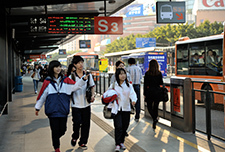 It [the GZ BRT] is well organized, well maintained, and I can see there is a lot of effort [that's] been put into it. It's gonna be a pilot project for the world. I've been learning a lot from this intensive site visit program, this is the most intensive program I've ever taken! I now have a deeper understanding of the BRT system. Thank you for ITDP's tireless efforts and persistence in China. Your pioneering accomplishments are inspiring to witness. I really enjoyed it and learned a lot. I came away energized by the possibilities. I feel like BRT is the safest and fastest transport on the road. It really inspired the students and gave them a perfect introduction to the importance of a smart public transportation system and its role within the city”. 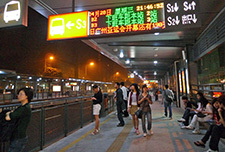 I've been to Guangzhou [to see the BRT] before and this time I just want to see it again! 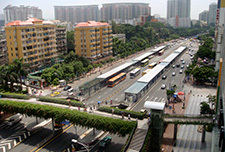 We visit Guangzhou today and are delighted to see the BRT system. We are the ITS consultants to Ahmedabad, Surat and Jaipur BRT. I heard the Guangzhou BRT works great, so came to visit it. I think it is a really great project, and maybe it can apply in our city. 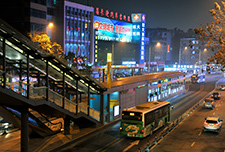 I think it is a really good opportunity to have this visit to see the Guangzhou BRT. Seeing is believing.